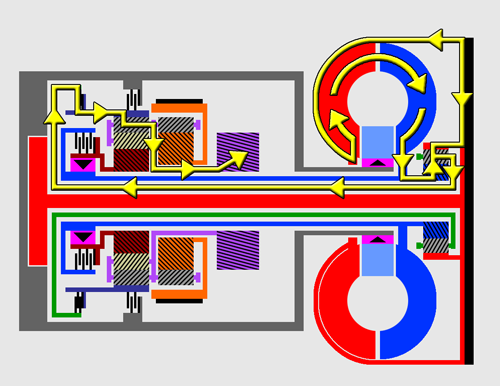 Buick’s two-speed Dual-Path Turbine Drive, used in the 1961–1963 Buick Special and Skylark, was probably the simplest of the three in this regard. As we’ve previously explained, Dual-Path had a single planetary gearset within the torque converter housing. The converter turbine drove the annulus of that gearset, whose planet carrier drove the output shaft. In first gear, a one-way clutch held the dual sun gears stationary. 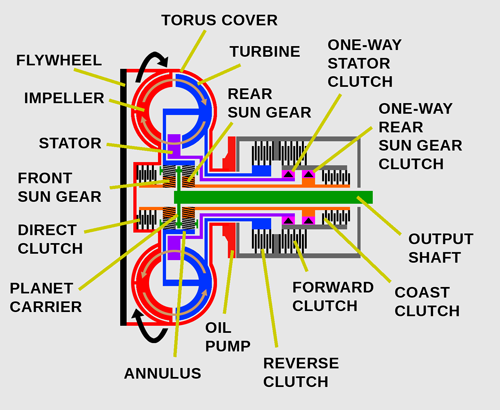 In second, a multi-disc clutch allowed the engine to drive the sun gears directly while the turbine continued to drive the annulus. Precisely calculating the second-gear torque split is complicated somewhat by the fact that we don’t know how many teeth the planetary gears have. We do know that the gear ratio in first, with the annulus driving and the sun gears held, was 1.58:1. (We would conjecture that the annulus had 66 teeth, the sun gears had 38, and the planets each had 14, which would make the exact gear ratio 1 + 38/66, or 1.5757:1.) 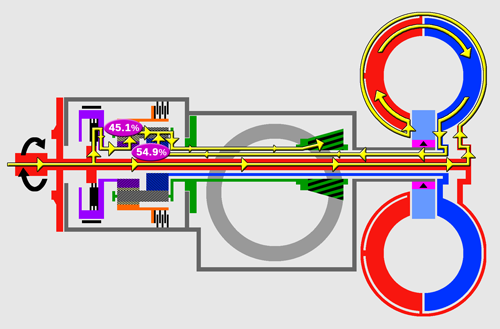 That’s enough to estimate that the annulus received about 63.3–63.4% (1 / 1.58) of input torque in second gear, with the remaining 36.6–36.7% applied to the sun gears. Since the sun gears were driven by the engine, the demultiplication effect was considerably smaller than in Hydra-Matic — less than 37%. 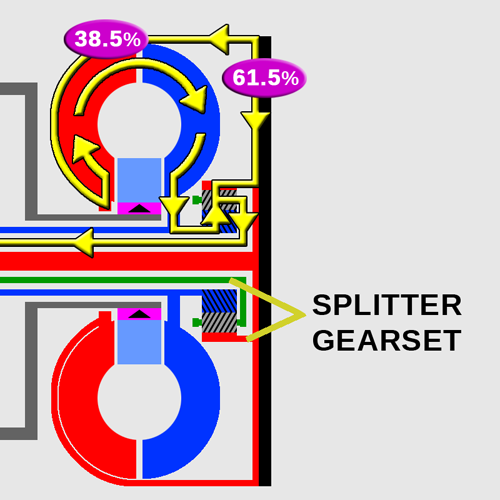 For example, if the engine was rotating at 2,000 rpm and there was 100 rpm of slippage in the converter, output shaft speed (discounting mechanical losses) would be about 1,937 rpm, effectively reducing hydraulic slippage from 5% at the turbine to about 1.8% at the output shaft. The automatic used in the 1961–1963 Pontiac Tempest and Le Mans, called TempesTorque, was a variation of the two-speed Corvair Powerglide, adapting the Corvair transaxle’s oil pump driveshaft to send power from the curved driveshaft to the torque converter at the back of the transaxle. 1961–1962 editions also had a split torque top gear, a feature Powerglide didn’t share. 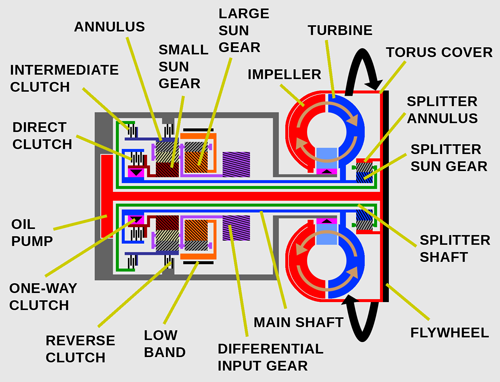 TempesTorque and Powerglide, like the older Ultramatic and Dynaflow transmissions, used a Ravigneaux gearset with a single annulus, two sun gears of different sizes (with different numbers of teeth), and six planets (three long, three short) on a planet carrier connected to the output shaft. As with Powerglide, TempesTorque’s driving member was the larger rear sun gear, which was driven by the torque converter turbine through the main shaft. 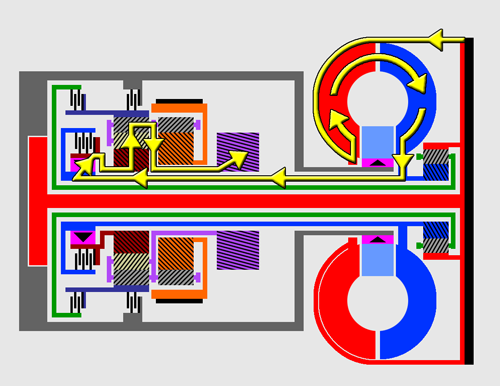 Unlike Powerglide, which obtained direct drive by also connecting the smaller front sun gear to the main shaft (forcing both sun gears to rotate at the same speed), the direct drive clutch of the 1961–62 TempesTorque served to connect the front sun gear to the central input shaft, which rotated at engine speed, not turbine speed. 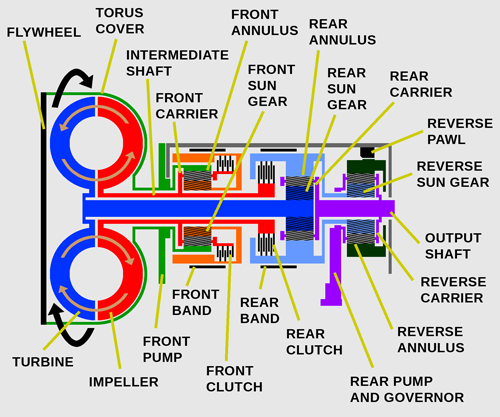 1961–62 TempesTorque transaxles shared the Powerglide gearset, whose annulus had 79 teeth and whose sun gears had 23 and 28 teeth respectively, giving first and reverse ratios of +/- 1.82:1. 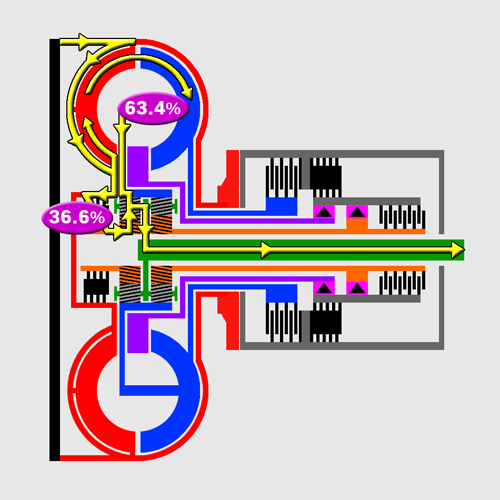 We’ll spare you the complex algebra, but in second gear, 54.9% of input torque went to the hydraulically driven rear sun gear while 45.1% went to the mechanically driven front sun gear. 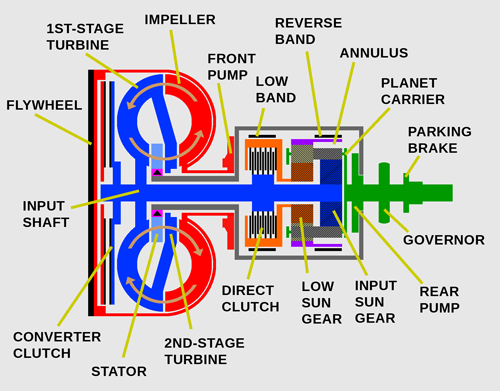 For example, at an engine speed of 2,000 rpm with 100 rpm of converter slippage, the carrier would rotate at 1,945.1 rpm, effectively demultiplying hydraulic slippage from 5% at the turbine to about 2.7% at the output shaft. For 1963, TempesTorque’s final year, the direct clutch was revised to connect the front sun gear to the main shaft rather than the input shaft, which eliminated the torque-splitting feature. 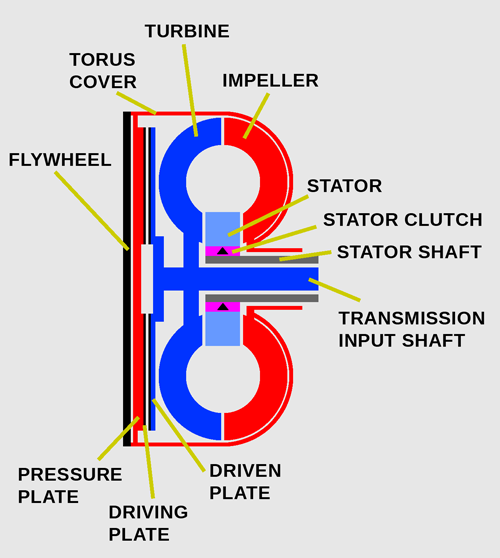 Detroit Transmission Division also applied the split torque principle to the simplified third-generation Model 240 and Model 375 Hydra-Matic transmissions (sometimes called “Roto Hydra-Matic”) used in the 1961–1963 Oldsmobile F-85/Cutlass, some Holden and Opel models, and most full-size 1961–1964 Oldsmobiles and Pontiacs. 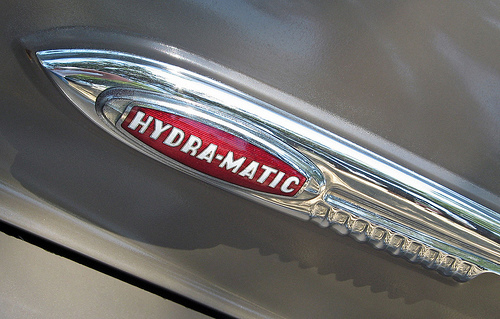 Unlike its predecessors, the third-generation Hydra-Matic was a three-speed transmission whose single dump-and-fill fluid coupling was transformed into a torque converter by the addition of a torque multiplier member (not a stator) between the impeller and turbine. 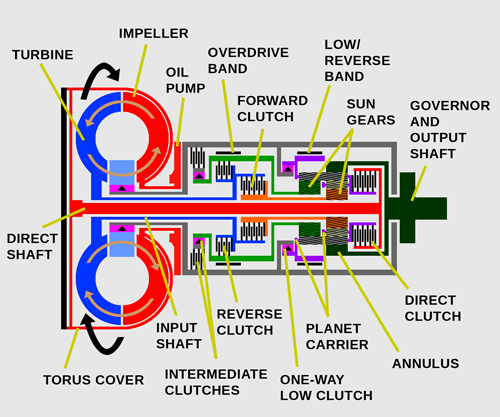 There were now two interconnected planetary gearsets with interconnected planet carriers, which were in turn connected to both the torque multiplier and the output shaft. 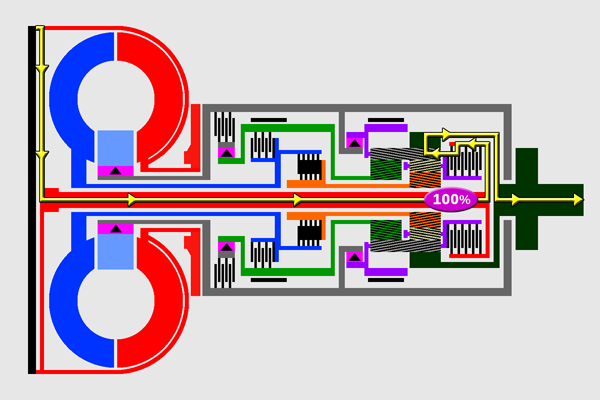 The front sun gear and rear annulus were also connected, forcing them to rotate (or not rotate) together at the same speed. A sprag clutch kept them from rotating backward in any forward gear. Roto Hydra-Matic’s operation was broadly similar to that of its dual-coupling predecessor, relying on alternately emptying and refilling its torque converter and engaging or disengaging its multi-disc front clutch. In first, the converter was full and the front clutch released. 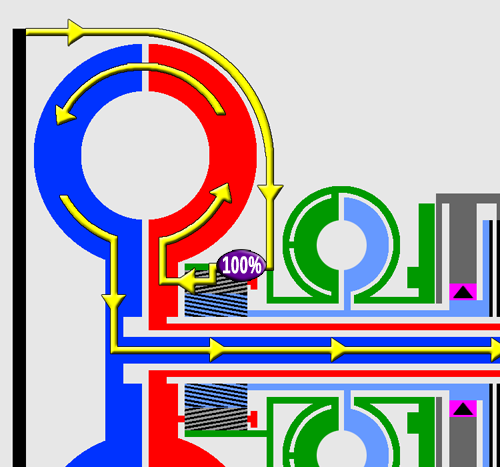 In second, the converter was empty and the clutch released while in third, the converter was full and the front clutch engaged simultaneously. There was no torque split in second, since with the torque converter empty, all power was transmitted mechanically through the torus cover and front clutch. 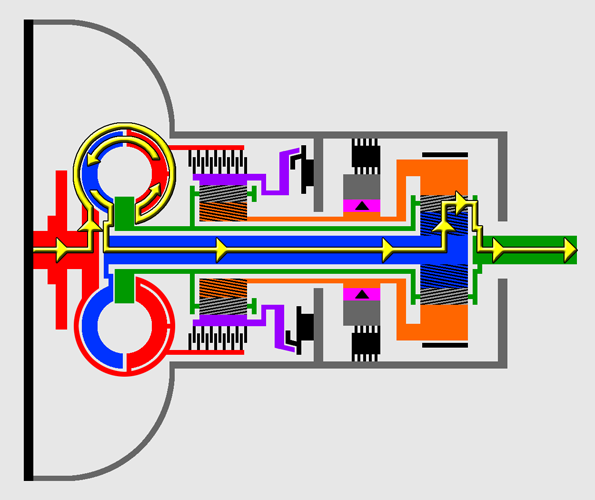 However, in third, power was divided between the mechanically driven front annulus and the hydraulically driven rear sun gear. Since this meant the front annulus was turning faster than the rear sun, its rotation drove the carrier around the slower-moving sun gears, resolving the speed difference. If we’re doing the math correctly, this demultiplied converter slippage by about 60%, depending on the specific front and rear gearsets used. 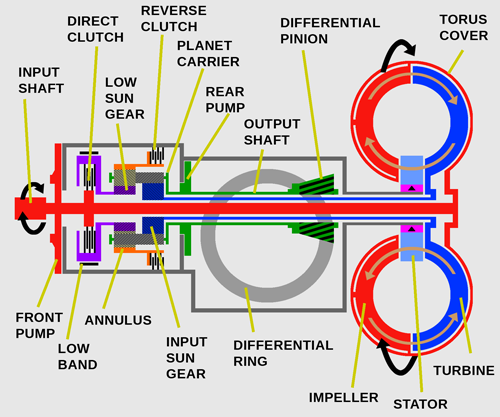 Under some conditions, a small amount of torque also flowed through the converter’s torque multiplier, which always turned at the same speed as the planet carriers and output shaft. GM abandoned its remaining split torque transmissions after the 1964 model year. 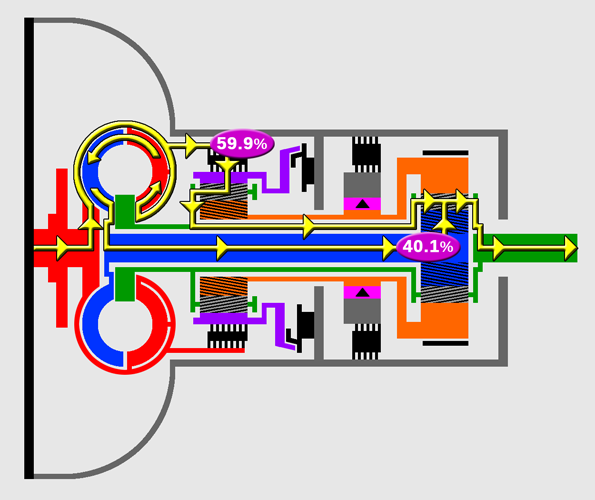 It appears that at least part of the rationale for the wholesale switch to more conventional automatic transmission layouts was the desire to more fully exploit torque converter multiplication — not only for starting, but also to bridge the gaps between the geared ratios, especially with two-speed automatics. In the sixties and early seventies, having the torque converter available in all gears was a higher priority for most American automakers than a slight improvement in highway fuel economy. That changed abruptly with the 1973–1974 OPEC oil embargo, which in the U.S. led to the enactment in December 1975 of the Energy Policy and Conservation Act of 1975 (EPCA). Title III of EPCA included the first-ever fuel economy requirements for U.S.-market cars. Those rules, now known as CAFE (for Corporate Average Fuel Economy), mandated a fleet average fuel economy of 18.0 mpg (13.1 L/100 km) for the 1978 model year. Since that was less than two years away, the EPCA rules sent automakers scrambling for quick fixes that wouldn’t interfere with their ability to also meet the latest federal emissions standards. Chrysler decided to revive the lockup torque converter clutch, which at the time was still used in some truck and bus transmissions and a few European automatics, but to our knowledge hadn’t been used in a U.S.-made passenger car in about 20 years. Although the fuel economy improvements a lockup clutch offered were modest, it was a feature Chrysler could quickly add to most of its existing passenger cars without a massive retooling bill. The addition also benefited an important Chrysler client: American Motors, which purchased Chrysler TorqueFlite automatics for its own vehicles. Chrysler’s lockup clutch, added to many (though not all) TorqueFlite transmissions for 1978, performed the same function as the old Packard Ultramatic unit, but with fewer parts. 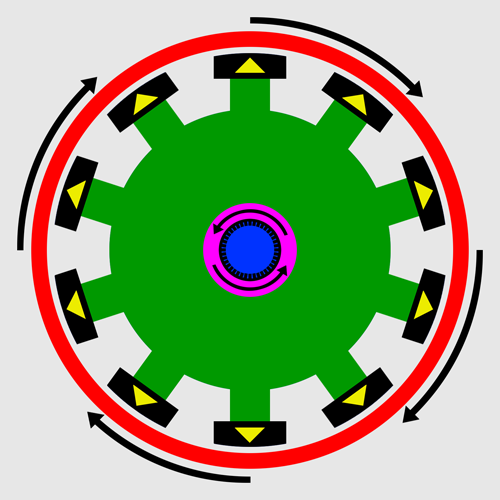 The actual friction surface was arranged in a ring around the inside front cover of the torus housing, between the flywheel and the torque converter turbine. 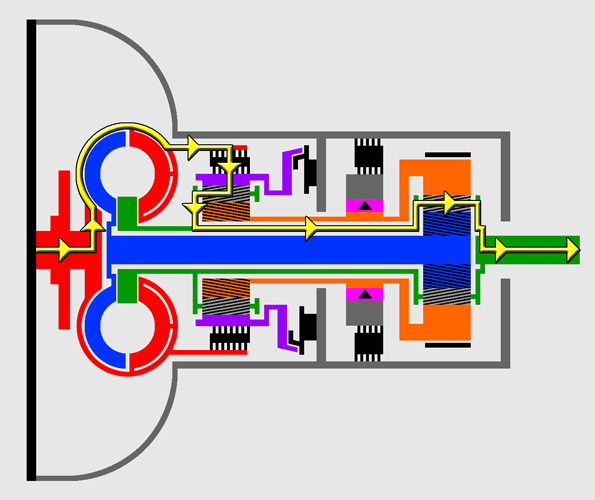 When engaged, a hydraulic clutch piston splined to the turbine hub slid toward the flywheel, locking the piston (and thus the turbine hub) to the torus cover and forcing them to rotate together at engine speed. As with Ultramatic, clutch engagement and disengagement was controlled in the same manner as a gear change, using opposing governor and throttle valve pressures to engage the clutch piston either after or simultaneously with a shift into third gear. Other automakers quickly followed suit. GM and Ford had added lockup clutches to all of their passenger car automatics by the 1982 model year. Many Japanese and European automatic transmissions were so equipped by the mid-eighties. Like the Chrysler and Packard units, most lockup clutches of the eighties and nineties were hydraulic, although a growing number used solenoids to open and close the hydraulic valves, allowing clutch engagement to be controlled by computer. 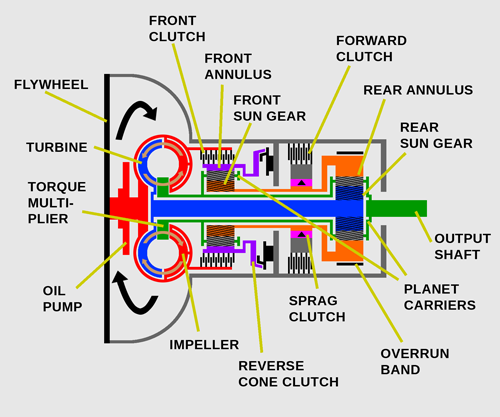 An alternative to the orthodox hydraulic lockup clutch was the centrifugally operated bypass clutch, which was a completely mechanical lockup not requiring any hydraulic controls. The idea had been around for decades and had previously shown up on some nonautomotive torque converters as well as a few passenger car automatics, notably the ZF unit offered in the Peugeot 404. 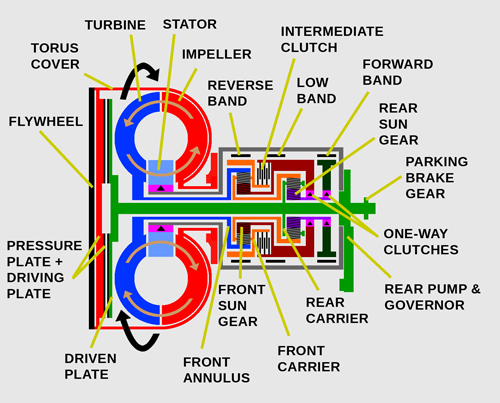 A variety of automakers and automotive suppliers, including GM, Borg-Warner, and JATCO, returned to the concept in the seventies, and centrifugal bypass clutches appeared on a variety of production automatics throughout the eighties. In the Borg-Warner type, developed in the seventies and used by Ford for its 1982–1986 C5 transmission and some front-wheel-drive transaxles, the actual clutch plate was permanently engaged, connecting the torque converter turbine to a transfer disc ringed with friction shoes. 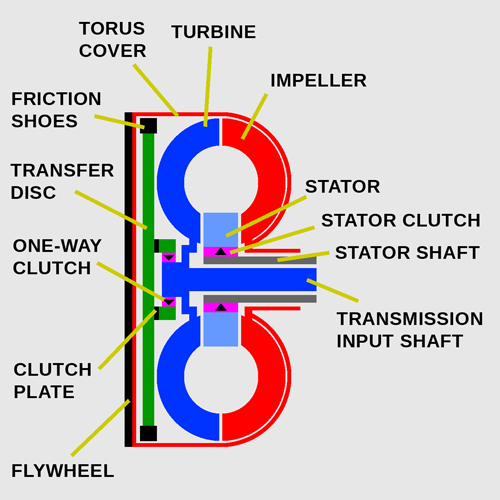 A one-way clutch in the transfer disc’s hub allowed the disc to drive the input shaft whenever the disc turned faster than the turbine. The friction shoes functioned in a manner analogous to the shoes of an expanding drum brake, using the torque converter’s torus cover as the drum. Shoe position was controlled centrifugally by a series of spring-loaded weights. With the turbine stalled, spring loading held the shoes in the disengaged position. Once the turbine started rotating, the weights’ inertia would effectively “throw” the shoes progressively outward, compressing the springs and forcing the shoes against the inner circumference of the torus cover. 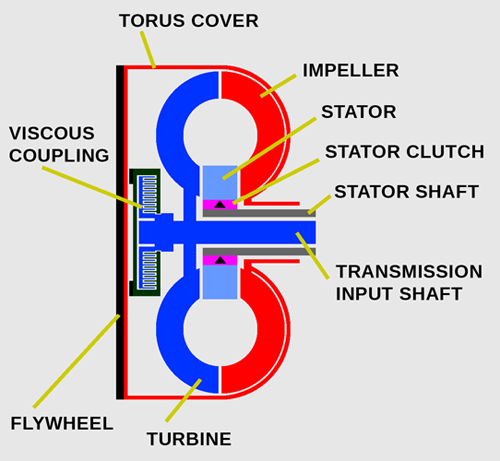 Under load, when the speed difference between the impeller and the turbine was large, the shoes would slip against the torus cover’s inner surface, allowing the torque converter to function normally. However, as the torque converter approached coupling stage, reducing the difference between engine and turbine speeds, the shoes would find enough purchase to wedge the transfer disc against the torus cover, forcing disc and cover to rotate together. 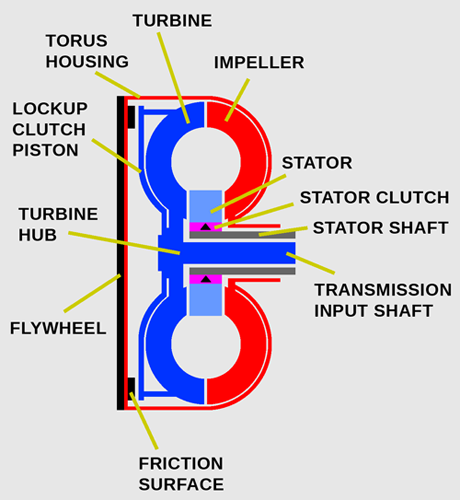 Since the torus cover was bolted to the flywheel and always turned at engine speed, this caused the transfer disc to overrun the turbine, locking the one-way clutch separating the two and forcing the torus cover, transfer disc, turbine, and input shaft to all rotate together at engine speed. A centrifugal lockup clutch had several advantages over the more conventional hydraulic variety. The most obvious was that it required no separate controls, making it somewhat cheaper than a hydraulically or electro-hydraulically controlled clutch. 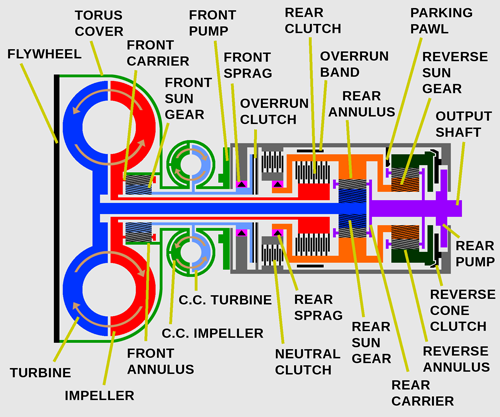 Also, because the lockup process was completely mechanical, dictated mostly by turbine speed, a centrifugal clutch worked in all forward gears, at least theoretically providing greater fuel economy benefits than lockup clutches that worked only in top gear. Furthermore, engagement was more progressive — and thus less obtrusive — than conventional hydraulic lockup clutches, which tended to engage and disengage with a noticeable thump. One tradeoff was that the friction shoes were subject to more wear, since they would slip any time there was a significant increase in load. Another compromise, at least for Borg-Warner centrifugal clutches, was they didn’t do much for engine braking, since the turbine could overrun the transfer disc. Another unusual lockup clutch variation, used in some versions of GM’s TH440-T4 (a.k.a. 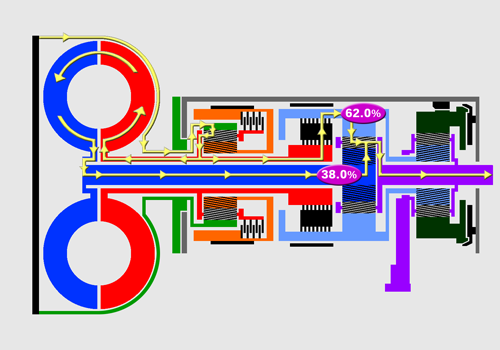 4T60) front-wheel-drive transaxle, was the viscous bypass clutch. 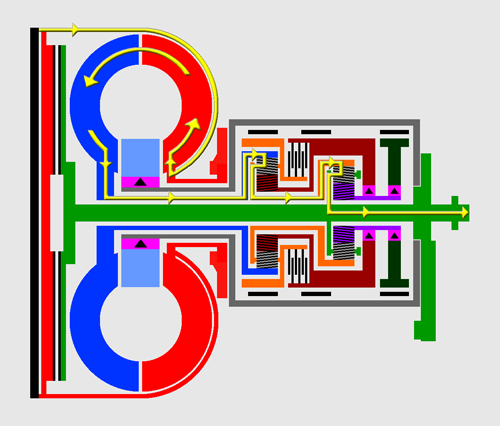 Developed in collaboration with Eaton Corporation and first used in the 1984 Cadillac de Ville, the viscous coupling was positioned between the torque converter turbine and the flex plate. 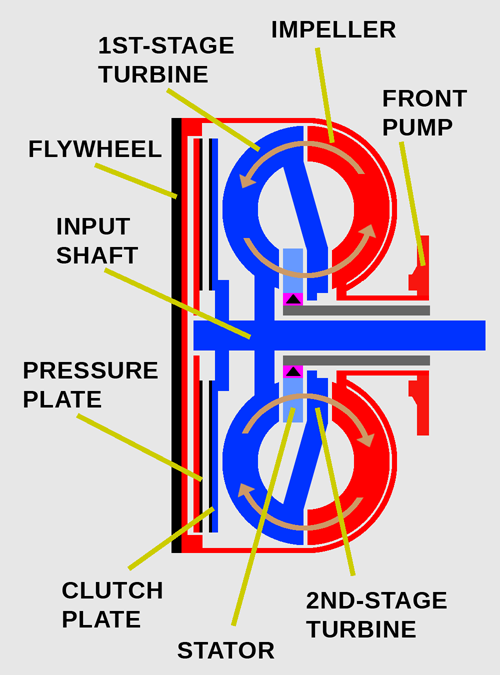 As with a conventional plate clutch, hydraulic pressure within the converter pressed a friction surface on the outside of the viscous coupling’s housing against the torus cover, causing the coupling’s driving (input) flange to rotate at engine speed. 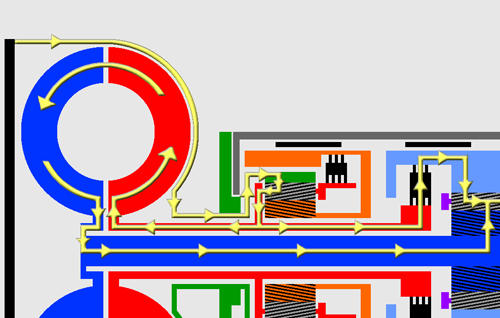 As engine speed increased, shear within the viscous coupling’s silicone working fluid would bind the driving flanges to the driven flanges, which in turn drove the transmission input shaft. 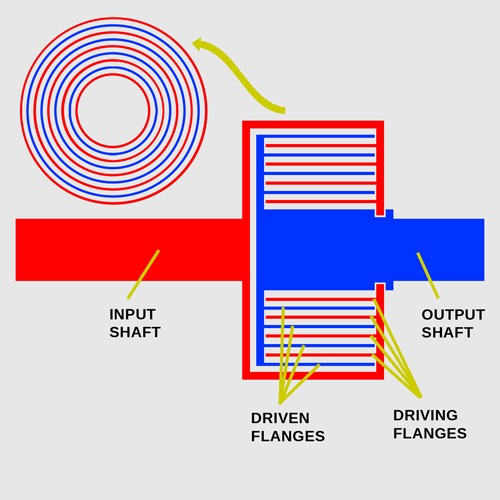 At higher speeds, pressure within the coupling would more or less lock the flanges together, causing them to drive the input shaft at close to engine speed. 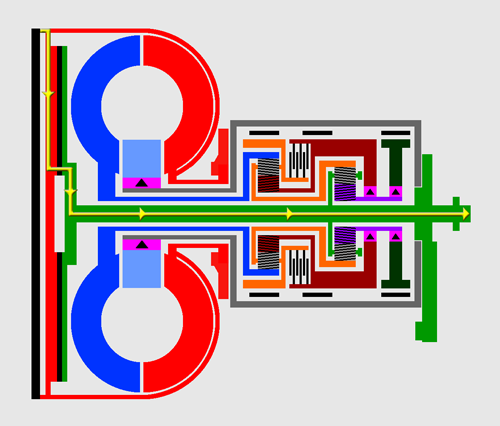 A control valve also allowed the viscous coupling to be completely disengaged when necessary by forcing the housing away from the torus cover surface. Unlike a plate clutch, the viscous coupling still allowed a small amount of internal slippage, which GM and Eaton argued was balanced by the ability to lock up at road speeds as low as 25 mph (40 km/h). 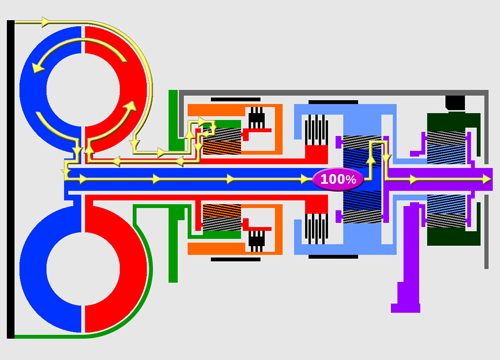 Just as importantly, so far as Cadillac was concerned, the viscous bypass clutch’s engagement or disengagement was progressive enough to be imperceptible. However, the viscous clutch was both less efficient and more expensive than the conventional lockup clutch used in other TH440-T4 applications.